Halloween is a fun and spooky holiday to decorate for! As a prop for a haunted house, create cardboard tombstones. You'll just need a few supplies to "build" really scary and creative tombstones, most of which you probably already own. You can make any size or type of tombstone you would like, but for this project, we'll build a 20-by-25 inch tombstone and make it a three-dimensional prop. If you plan to display your tombstones on walls or windows, then you don't need to make the base, but making it three-dimensional will allow them to stand on their own. Tip: Be sure to use a box that is a little larger than the final dimensions of your tombstone to give yourself some play room, as well as a little extra cardboard in case you make a mistake. Place a bowl upside down, with the upper lip located just below the top of the box, on one of the two larger sides of the box. Use a marker or pen to trace a half circle around the top side of the bowl. Use a ruler and your marker to carefully draw two parallel lines from the rounded ends of the tombstone top to the bottom of the box. This will be one side of your tombstone. Use scissors or a utility knife to cut out the tombstone. If you are a little off, that's fine. You and the children can adjust later. If you are only planning to build a two-dimensional tombstone, your job is finished for this section. Skip to the third section, "Paper It Up and Paint," to continue. Cut apart the sides of the box. Carefully cut around the bottom of the box and remove it. You should now have four separate, unattached, sides of the box as well as a separate bottom. Lay the second large side of the box flat, place the tombstone side that you just cut on top of the flat panel. Use the marker to trace around the tombstone, and then cut out the second tombstone side. Cut a 20 by three-inch strip from the bottom of the box. This will be your "support" piece. Cut two more three inch pieces from the bottom or sides of the box, each about 23 inches high. These will serve as the sides of the tombstone. Using duct or packing tape, tape the "base" to the bottom of the front-facing and back-facing pieces. Use the two other strips as the sides of the tombstone; place each one flush with the sides of the tombstone and use the tape to secure them. You'll have a bit extra, so simply trim the excess with the knife or scissors. Use newspaper or butcher paper to cover the top of the tombstone. Tape the paper into place. If you like, you can also cover the front, back and sides of the tombstone with paper. Use some of the newspaper or butcher paper to cover and protect your work surface. 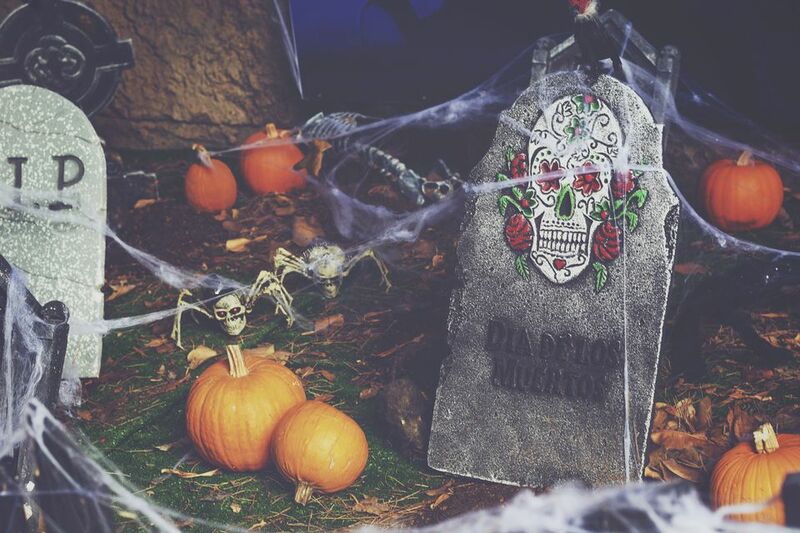 Use flat, gray spray paint to color the tombstone, and lightly spray or splatter black paint here and there to give it a gravelly appearance. Then use regular acrylic paint and write creative epitaphs on the tombstone. You can also paint designs on your tombstones or paint cracks around the edges. Protect your paint job with a coat or two of clear acrylic sealer. To make these tombstones stay in place in your outside cemetery try taping them to garden stakes. Your children will be happy and maybe a little scared of the spooky decorations!